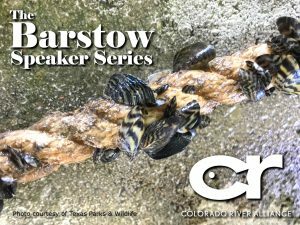 On Friday, June 15th, please join the Colorado River Alliance for a lunchtime presentation on some very unwelcome new arrivals in the Colorado River — invasive zebra mussels. These highly destructive and prolific critters were first confirmed in our river last summer, and now they’re in Lake Travis, Lake Austin, and Lady Bird Lake. How bad is the threat, and what can we do? Join us to get your questions answered. The discussion will include what zebra mussels are and how they got here, the economic and environmental threats they pose, what boat owners and lakefront-property owners need to know, the latest updates on where they’ve been found, and how new tech tools may help us monitor zebra mussels and potentially even control their spread. This event will be held from 11:30 a.m. to 1 p.m. at the Austin Board of Realtors’ Canyon View Event Center (map). Speakers include Monica McGarrity, Aquatic Invasive Species Team Leader for Texas Parks & Wildlife; Stephen Davis, the LCRA biologist who leads monitoring efforts across the Colorado River basin; and John Higley, CEO and Principal Scientist at Environmental Quality Operations (EQO), a start-up that is developing new technologies to help us address the zebra mussel challenge.